The kids will soon be out of school - and you may be dreading it. The first week or so they'll be thrilled with their new freedom, and then… They'll start the "I'm bored – there's nothing to do" routine. And when they get too bored, they'll start squabbling with each other. Trying to find "fun things" for the kids to do and trying to keep them from picking on each other can turn the most patient and loving parent into a jumble of ragged nerves - apt to explode at any time. And no parent wants to explode. It just happens sometimes when the pressure gets to be "too much" and patience flies out the window. The good news is, Feel Bach! has a remedy to smooth those jagged nerves. 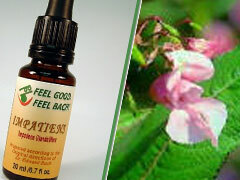 Dr. Bach's flower essence "Impatiens" is just the thing. A couple of drops under the tongue 3 or 4 times a day, and you'll soon find your nerves, and your patience, returning to normal. As the name suggests, Impatiens is the essence of patience. It is used most for people who are generally impatient - those who are quick-witted and move at a fast pace. These are the folks that, when forced to supervise or work in cooperation with others, generally want to just push the other people out of the way and do the job themselves because they can do it faster and better. Individuals who have the Impatiens personality should not be forced into working with others who might not keep their pace. Unfortunately, we sometimes have to do tasks that don't fit our personalities, and in that case Impatins comes to the rescue.